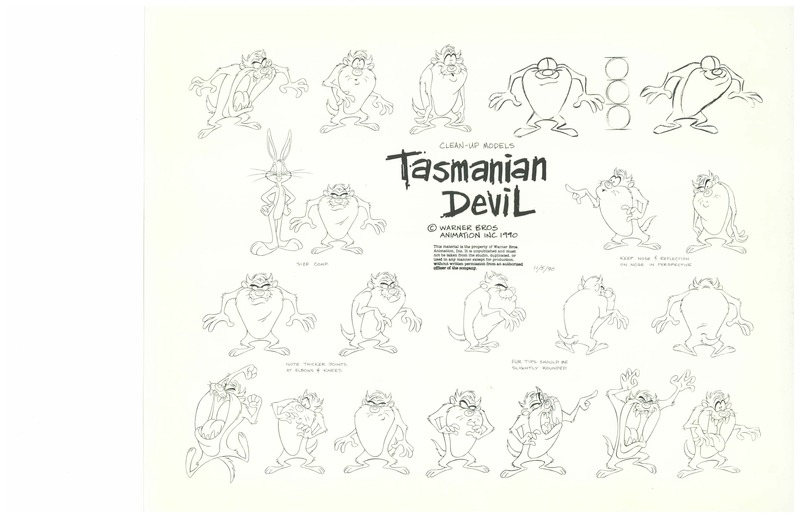 It’s Model Sheet Monday again and today’s model sheet is actually from Chuck Jones studios. It’s a breakdown of some construction notes for one of my favorite characters in the Looney Tunes world; Foghorn Leghorn! One of my favorite quotes Foghorn used to say was: “”That boy’s about as sharp as a bowling ball” And it’s SO descriptive. Just love it. Here’s a list of more great quotes from Foghorn over the years along with a number of Foghorn cartoons! Big, boisterous and really not afraid of much, Foghorn was particularly adept at torturing the dog in on the farm, and in turn being tortured by Henery Hawk (both model sheets to come later) which I never got tired of. I particularly liked when Foghorn would whack the dog with a 2×4 and then run and the dog would choke on the rope. I always thought that these were Robert McKimson’s best cartoons. Here’s a much more refined one from 1959 some years later. Here’s a list of great quotes from Foghorn over the years along with a number of Foghorn cartoons! A leghorn is a breed of chicken, and foghorn describes the character’s loud, overbearing voice. According to Leonard Maltin the character’s voice was also patterned after a hard-of-hearing West Coast-only radio character from the 1930s, known simply as The Sheriff, on a radio program called Blue Monday Jamboree. The voice has similarities to that of another Mel Blanc voice: Yosemite Sam (a strictly Friz Freleng character). 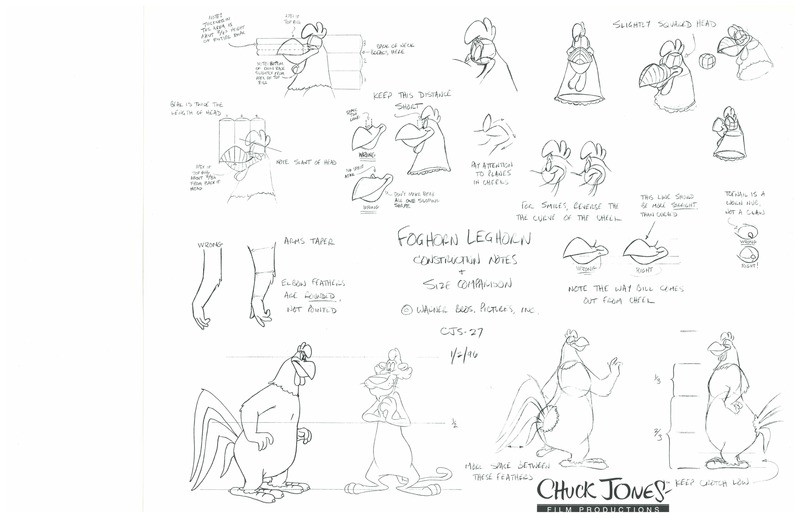 Here’s some more about this week’s model sheet star Foghorn Leghorn, from our ol’ friend Wikipedia! Click the image to see the full -size pic. It’s Model Sheet Monday again and this week we’re showing the biggest and the baddest. the master of disaster and the king of comedy, Bugs Bunny! This particular model sheet was drawn by Bob Scott and cleaned up by Harry Sabin. Who didn’t want to be Bugs Bunny? I mean come on! The guy didn’t run from guns, genies, lions, bears, hunters, wrestlers, rustlers, thieves, and opera singers. He had more guts that John McClain! Bugs Bunny was my hero as a kid and one of the my favorite characters in the Looney Tunes world and the few times I got to draw him were awesome. he was deceptively hard to draw and I often made his muzzle too big. That said, Bugs is pretty awesome! 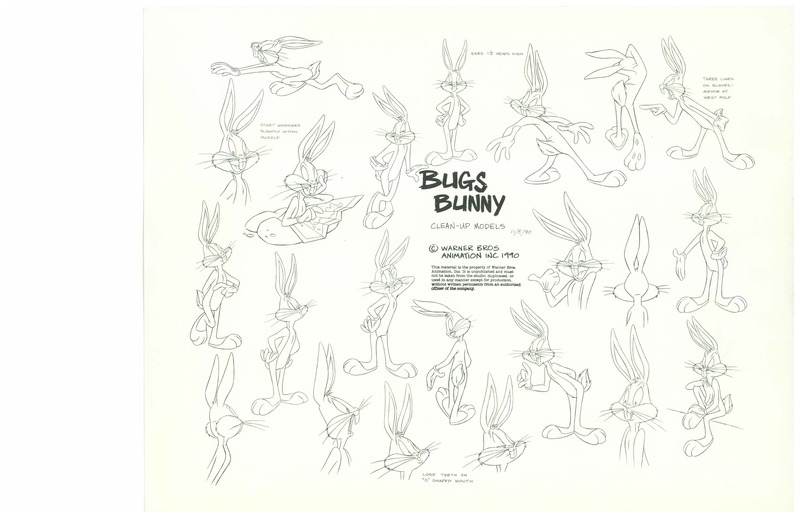 There are many versions of Bugs Bunny design as you can see above and even one past this model sheet in the form of Jessica Borutski’s design for CN’s Looney Tunes show which I actually admire for it’s sheer appeal and draftsmanship (draftswomanship?). We incidentally interviewed Jessica some time ago. 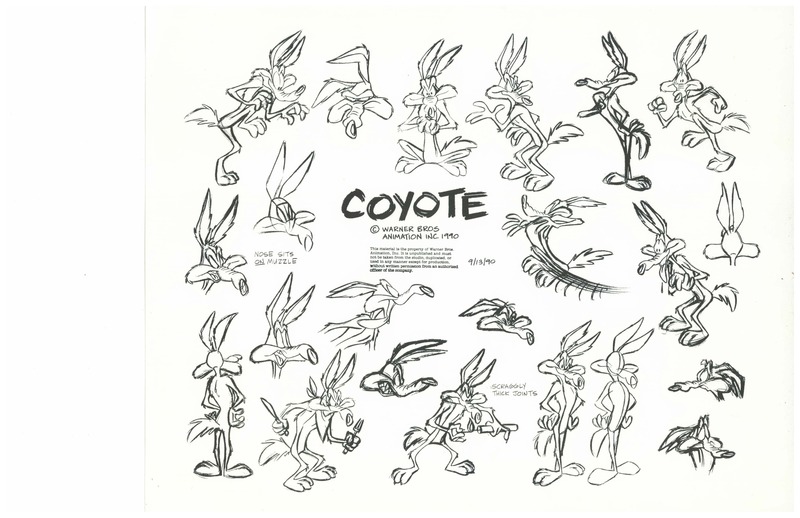 Personally I prefer the old Chuck Jones design the best and then if I had to choose a second it would be the Bob McKimson design after that but as far as drawing Bugs, Chuck ruled in my book. There was an appeal he had in the heyday of films like Wackiki Wabbit, The Case of the Missing Hare, and Water, Water Every Hare, which were just the epitome of Bugs Bunny and to me no one did him better than Chuck back then. The design had an appeal that I think got lost in the later days, especially once Chuck decided to Grinch Bugs up a bit. What was your favorite Bugs Bunny design? Sorry for the lack of quality on this last one. By the time Chuck got to Barbary Coast Bunny, I wasn’t a fan anymore. Bugs Bunny is a funny animal cartoon character, best known for his starring roles in the Looney Tunes and Merrie Melodies series of theatrical short films produced by Warner Bros.during the Golden age of American animation. His popularity during this era led to his becoming a cultural icon, as well as a corporate mascot of Warner Bros. Entertainment. Bugs is an anthropomorphic gray hare or rabbit who is famous for his flippant, insouciant personality, a pronounced New York accent, his portrayal as a trickster, and his catch phrase “Eh… What’s up, doc?” (usually said while chewing a carrot). Bugs has appeared in more films (both short and feature-length) than any other cartoon character and is the ninth most-portrayed film personality in the world. According to his 1990 “biography” Bugs Bunny: 50 Years and Only One Grey Hare, Bugs was born on July 27, 1940 in Brooklyn, New York in a warren under Ebbets Field, home of the Brooklyn Dodgers. In reality, he was brought to life by the animators and staff of Leon Schlesinger Productions (later Warner Bros. Cartoons): including Tex Avery, who directed Bugs’ early definitive film A Wild Hare (1940); Robert McKimson, who created Bugs’ definitive character design; and Mel Blanc, who originated the voice of Bugs. …and you can read the full write up of Bugs Bunny here. Tagged model sheet Monday, Warner Bros.
Click the image to see the full sized model sheet! Today’s model sheet comes from the classic Warner Bros division run by Darrell Van Citters back in the early 1990’s. Pepe Le’ Pew was an interesting character who would not take no for an answer. He wasn’t my favorite but I admittedly did enjoy him lackadaisically chasing the cat around and the quick cutting, her panicked and him playfully hopping to catch up. Of course at the time I had no idea he was essentially a stalker and that she probably had a restraining order on him! I don’t think you could get away with a cartoon like this today, except maybe on Family Guy. I have in the past worked with hygienically challenged people who left a waft of stench behind them so I would argue that the science is solid surrounding his scent cloud. I was fortunate enough to be able to animate Pepe in a Marshall’s commercial back in the early 90’s myself while working at Warner Bros. Animation. This particular model sheet was drawn by Shawn Keller. Pepé Le Pew storylines typically involve Pepé in pursuit of what appears to be a female skunk (“la belle femme skunk fatale”). But, usually, the supposed female skunk is actually a black cat (retroactively named Penelope Pussycat) who has had a white stripe painted down her back, often by accident (as by squeezing under a fence with wet white paint). Usually Penelope runs away from him anyway because of his putrid odor or because of his overly assertive manner. As Penelope frantically races to get away from Pepé, he hops after her at a leisurely pace. 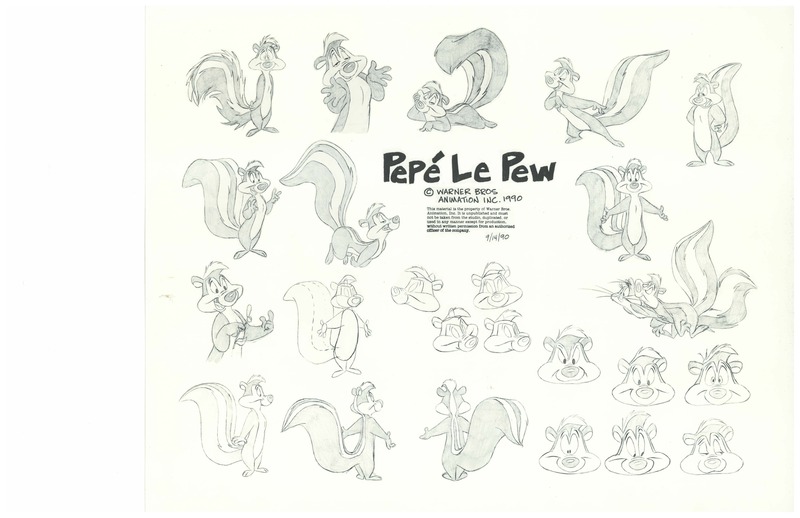 Here’s Chuck Jones talking about creating Pepe’ Le Pew. Click the image to see a full size one. Today’s model sheet comes from Warner Bros and he’s on TV Guide‘s 2013 list of The 60 Nastiest Villains of All Time. For me as a kid, he was one of the most frustrating characters because he constantly did the stupidest things even though we clearly saw he was building that hut on the train tracks! It was in many ways like watching a Ben Stiller movie before they existed. My two-year-old daughter summed it up for me best the first time she ever saw a series of Coyote and RoadRunner cartoons. She was watching the coyote set up some Rube Goldberg sort of trap which naturally fails, sending a boulder sky high and down towards poor ol’ Wile E. Coyote. The next trap involved a him trying to trick the RoadRunner to run off a cliff which of course backfires sending him off instead in the classic scene we all know and love. Still makes me laugh! Anyway, This model sheet was beautifully drawn by, I believe, Shawn Keller. Wile E. Coyote was created by animation director Chuck Jones in 1948 for Warner Bros., while the template for their adventures was the work of writer Michael Maltese. The characters star in a long-running series of theatrical cartoon shorts (the first 16 of which were written by Maltese) and occasional made-for-television cartoons. In each episode, instead of animal senses and cunning, Wile E. Coyote uses absurdly complex contraptions (sometimes in the manner of Rube Goldberg) and elaborate plans to pursue his quarry. It was originally meant to parody chase cartoons like Tom and Jerry, but became popular in its own right. The Coyote appears separately as an occasional antagonist of Bugs Bunny in five shorts from 1952 to 1963: Operation: Rabbit, To Hare Is Human, Rabbit’s Feat, Compressed Hare, andHare-Breadth Hurry. While he is generally silent in the Coyote-Road Runner shorts, he speaks with a refined accent in these solo outings (except for Hare-Breadth Hurry), introducing himself as “Wile E. Coyote — super genius”, voiced with an upper-class accent by Mel Blanc. The Road Runner vocalizes only with a signature sound, “Beep, Beep“, recorded by Paul Julian, and an occasional “popping-cork” tongue noise. To date, 48 cartoons have been made featuring these characters (including the three CGI shorts), the majority by Chuck Jones. Back in 1990 I started my L.A. animation career working on on an old forgotten show called Tazmania doing the now more-or-less defunct job called Character Layout. This was the model sheet we used and I can clearly remember us all drooling over this sheet. So crisp, so well drafted and so cool! This model sheet was drawn by Chris Buck who is now directing Disney’s Frozen. Click on the model sheet to see an larger version.